alpha-PVP, (a-PVP herein) is a potent stimulant which became popular after mephedrone was banned. Its typical dose is around 20mg and it has a natural numbing effect which leads it to be sold as cocaine and occasionally even as MDMA! Because of its high potency it can cause serious issues when sold pure so detecting it is pretty important, and we could not find reference data for the liebermann and froehde reagent test kits. The froehde reagent did not yield any colour change but did fizz, indicative of the common HCl salt. The liebermann reagent gave a light yellow colour. It was a bit stronger in reality than in the photo but it was still not a strong reaction. a-PVP does not give a colour change with the marquis reagent. 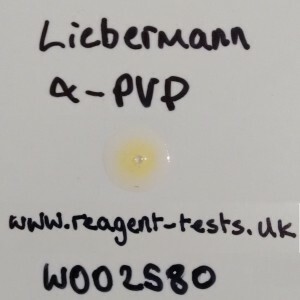 This sample was tested as being a-PVP by WEDINOS.